"Shooting Situation: Working Your Subject"
Working your subject requires a great deal of patience as well as a good quantity of images. 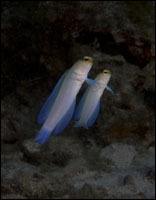 The camera had to be placed very close to the sand in order to create a separation of the Jawfish from the sandy bottom. 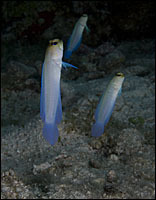 The composition is too busy and the Jawfish blend into the background. 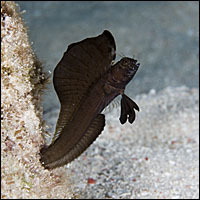 The composition is better, but the Jawfish still blend into the background. 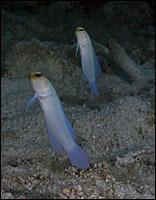 The Jawfish have been separated from the background by moving the camera closer to the sand. 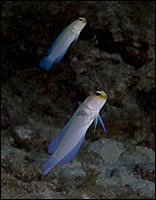 Good separation of the Jawfish from the background. Sometimes working a subject simply means keep shooting until something interesting happens. 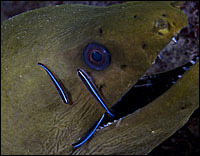 By changing camera angles (along with the help of ever-moving Neon Gobies) you can achieve a variety of good images from a single subject. Persistence often pays dividends. By staying with a subject over a long period of time. You can capture different behaviors. 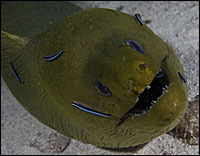 You can also approach subjects for close-ups once they get used to your presence. Sometimes you have to simply wait for your subject to do the one thing it is known for.